Boden said that the Planning for Elders HealthCare Action Team (HAT), which was making a dramatic show of senior power in City Hall just before the rally, shouldn’t be reduced to begging legislators not to cut funding for the elderly. As with the other poorest members of society, Boden argued that elder constituents should be given adequate support no matter the fiscal situation. James Chionsini, Interim Executive Director of Planning for Elders, helped coordinate the pre-demonstration visit that 75 senior and disabled San Francisco residents paid to City Hall. The activists followed up on a letter asking the representatives to endorse a pledge of support for seniors and the disabled. Activist Keith Kemp spoke at the Federal Building. He described being homeless and subsequently living in a single room occupancy hotel for six years while waiting to secure more stable housing. As rain drizzled down, Kemp told the assembled activists that pending cuts would freeze an already untenably long San Francisco Housing Authority waiting list for subsidized housing. In a conversation after the demonstration, Boden told me that advocacy “groups are lobbying on specific pieces of the legislation,” but that there isn’t enough coordination between groups fighting to defend their own turf. Arguing that, “homeless issues are actually community issues,” Boden feels that the only way to effectively fight back against the cuts is through a broader social justice movement. He pointed out that without enough pressure from the grassroots, Democrats, shortly after acquiescing on extending the Bush tax cuts for the wealthiest, let Republicans control public debate about cuts to social services. “We do subsidize housing,” he added, “but it’s for the upper end of society.” He explained that 75 percent of the $144 billion in mortgage interest deductions benefit homeowners earning more than $100,000 a year. National Alliance of HUD Tenants details the proposed cuts: $1.6 billion cut to public housing below the FY 2010 level; $1.47 billion cut to Section 8 vouchers below the President’s request for FY 2011; $2.9 billion cut—2/3 of the overall program—to Community Development Block Grants, which help cities address affordable housing, job training, domestic violence, and other anti-poverty needs; and $760 million—2/3 cut—to housing for the elderly and disabled. Herman Bonner lives in Chicago and is the National Alliance of HUD Tenants’ Board President and a disabled Section 8 tenant. He echoes Tracy’s analysis. 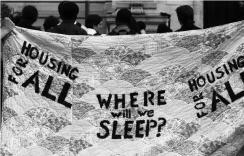 At the time of the Valentine’s Day protests, he said, “The Republicans' Tea Party' budget is a Valentine's Day Massacre on America's poor.” Chicago activists had their protest on February 25, when more than 300 HUD tenants, service providers, and supporters marched to protest HUD budget cuts. Protestors constructed a cardboard “Tea Party Housing Development” and blocked traffic near the Chicago Federal Building, where Illinois Senators Durbin and Kirk have offices. Eleven demonstrators were arrested and then released after a few hours. In a phone interview, Bonner told me, “I’d like people to know this might not be you right now, but you too can be put into this situation. Don’t wait until it happens to you before you join the fight.” Bonner had a good salary working as a railroad foreman but was left disabled by an accident and wound up homeless. After moving back into his family’s apartment in the projects, he caught wind of plans to sell the HUD-managed building and convert the units into condos. He responded by working quickly with several others to organize tenants; they successfully opposed the sale. Meanwhile, though some lip service has been given in Congress to potential Pentagon cuts, war funding provokes little debate. Democrats have gone along with Republicans in calling America “broke” and stressing the need to rein in spending. But few from either party have expressed concern about the money being spent on our wars in Iraq and Afghanistan, not to mention million-dollar cruise missiles in North Africa. Ben Terrall is a writer who lives in San Francisco. His work has appeared in the San Francisco Bay Guardian, Counterpunch, In These Times, Terrain, and other fine publications.